The Uniqlo 3way bag is called this because it can be used as a briefcase, backpack and a shoulder bag. While fully packed I found it a bit heavy to comfortably wear as a shoulder bag for any extended period of time. I did find the briefcase handles on the side very useful for times when you need to take off the bag and get it scanned. Such as through x-rays at the airport and while travelling on the train. However the majority of the time I used the bag as a backpack. One of the greatest features of this bag is just how lightweight it is while empty. It weighs just 500g (17oz) which makes it the lightest main backpack that I’ve come across. I’m not sure the capacity in litres as it is not listed but I would guess it’s in between the 20 to 25 litre capacity mark. The 3 way bag has a great assortment of pockets that are well thought out. Two front pockets the top one which has a couple of inner pockets for notebooks and pens. Then there’s the main compartment which has a padded laptop area, and two pouches on the other side. The bag is made from a cordura polyester fabric that it claims to be resistant to abrasion, wear, and tear. I haven’t tested it as extensively as I would have liked yet but I did wear it most days through my travels through China for 2 weeks. The fabric feels quite strong and durable and the water does repel from the fabric but it is prone to seeping into the zipper areas. In terms of usability this bag really surprised me. Although it doesn’t unzip totally flat, it unzips in a vertical manner which I actually found extremely useful especially when I needed to quickly access a certain item in my bag while travelling, walking or going through the airport security. This is because the bag sits upright when you put it on the ground. The bags backpack straps, which can be tucked away, are not the most comfortable backpack straps that I’ve used but were able to comfortably support 6kg (13lbs) for a full day walking around. I don’t really like the position of the straps though because when worn as a backpack the bag sags backwards making it look and feel a bit ‘top heavy’. The bag comes with an additional strap that can be attached to the two anchor points on either side of the bag and although the strap doesn’t have any padding it was fairly comfortable and would be more comfortable the lighter you pack. Unfortunately the strap could not be adjusted much higher than about waist level. I would have preferred to be able to wear it a bit higher. 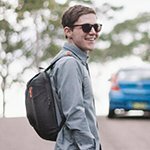 This bag is an absolute bargain at only USD$39 (AUD$50) especially considering it’s made from a cordura fabric and can be worn in 3 different ways. Its also good quality and feels like it will last for quite some time. I would very highly recommend this as a great bag for the beginner or advanced light traveller.